Preheat your waffle maker. It should be the non-stick variety, or you’ll have nothing but frustration since this recipe uses no fat at all. Put your flour in a large mixing bowl. Add your soy milk to the flour. 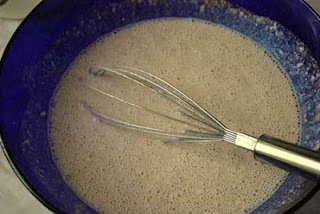 Add your vanilla and cinnamon, and blend vigorously with a whisk. Using a ladle, pour your batter into your waffle maker, and cook until golden brown. Top these waffles with nuts, fruit, honey, maple syrup or anything your diet allows. They’re yummy and really filling. Storage: If you end up with more than you can eat (and you probably will), just pop them in the freezer. They make a quick, make-ahead breakfast when you can just pop them in the toaster. 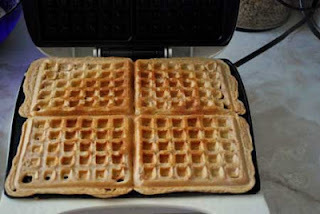 Once these have cooled, place small pieces of parchment paper between each waffle and place a stack of them in a Tupperware container or large Ziplock bag. Keeps in the freezer for up to 4 months.